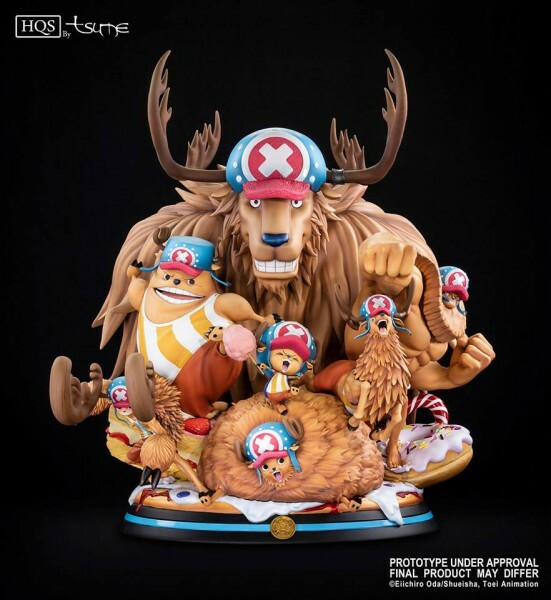 Produktinformationen "One Piece - Tony Tony Chopper Statue / HQS: Tsume"
Die berechnung der Versandkosten für Deutschland und Lieferungen [in das Ausland] können leider auch erst nach Ankunft der Statue bei uns im Lager bestimmt werden, bitte die Tatsache berücksichtigen, da die genauen Paketabmaße und Menge der Paketanzahl bekannt sind! Limited Edition : 2500 pieces. Tony Tony Chopper joins his crewmate in our HQS by Tsume line. Still at 1/7th scale, this ambitious and generous statue gathers in a 100% original creation the seven forms the Straw Hat’s doctor can assume! On one statue, get Chopper in Brain Point, Heavy Point, Walk Point, Guard Point, Kung Fu Point, Horn Point, and even the gigantic Monster Point! This piece of art is both dynamic and colourful, highlighted with a Whole Cake Island themed base. Very technical, this set of characters of very different size displays balance and harmony. Each pose is dynamic yet no characters shadows any other. Second technical point: Chopper’s fur. It differs greatly from one “point” to another, yet they need to be coherent altogether. The colouring reveals the same will to deliver a statue accurate to each character, and yet balanced and contrasted. Weiterführende Links zu "One Piece - Tony Tony Chopper Statue / HQS: Tsume"
Kundenbewertungen für "One Piece - Tony Tony Chopper Statue / HQS: Tsume"